Just in Time for the Holidays – Living Atlas Updates to Streets and Topographic Maps! Updates to the Streets and Topographic Maps Available! This release incorporates new and updated content to the World Street Map and the World Topographic Map for federal lands, cities and counties in the United States, and select locations in Australia, Canada, and South Africa. This Story Map Series visits selected areas in several communities where new and updated content are available. Esri Canada has detailed basemap updates in this Christmas edition blog. How do I Use? Combine content from the Living Atlas with your own data. Create powerful new maps and applications! How do I contribute? Join the growing community of Living Atlas of the World contributors. There are two ways to contribute! Learn more about the ready-to-use content that is available in the Living Atlas of the World, including how you can contribute your maps and data. Living Atlas Newsletter: This newsletter will keep you and other members of the Living Atlas user community informed through success stories, examples of applied use, visibility of new content, announcements about events, and other useful resources and information. Subscribe to the Esri News for the Living Atlas Community. You can have the newsletter sent right to your inbox by subscribing here. 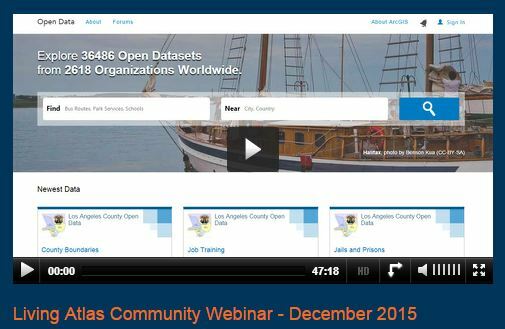 Living Atlas Webinar Series: Living Atlas Community Webinar – December 2015. To answer growing open data demands by sharing your data with the public to enable them to access, explore, and use your data to solve real world problems. Esri Canada has undertaken a Community Maps Program initiative in their own country, and the value organizations find from contributing to this collective effort to build a better national map. 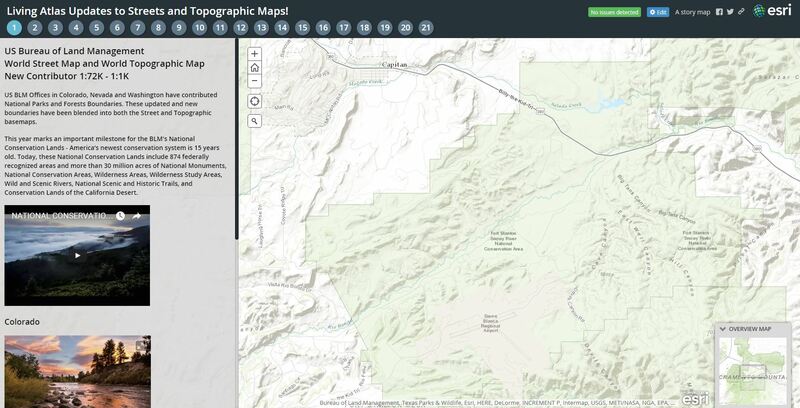 Contributing your high-resolution, current imagery to the World Imagery Map through the Community Maps Program helps you and the GIS community. Contributing your imagery comes with no processing or hosting costs, making this an ideal way to make your imagery accessible to a broad audience. Share your story: How has contributing to the Living Atlas Community benefited your organization and community? Has your participation helped meet a particular challenge? Has your applied use of Living Atlas content solved a problem or help meet a goal? Email me at smatthews@esri.com so we can promote your success. If you have previously used the World Topographic Map or the World Streets Map services, you may need to clear your cache in order to see the updates. If you have feedback on content, try our Topographic Map Feedback web map, or Street Map Feedback web map. If you have other feedback or comments, please post them to the ArcGIS Online Discussion Group and the Living Atlas Discussion Group on GeoNet.